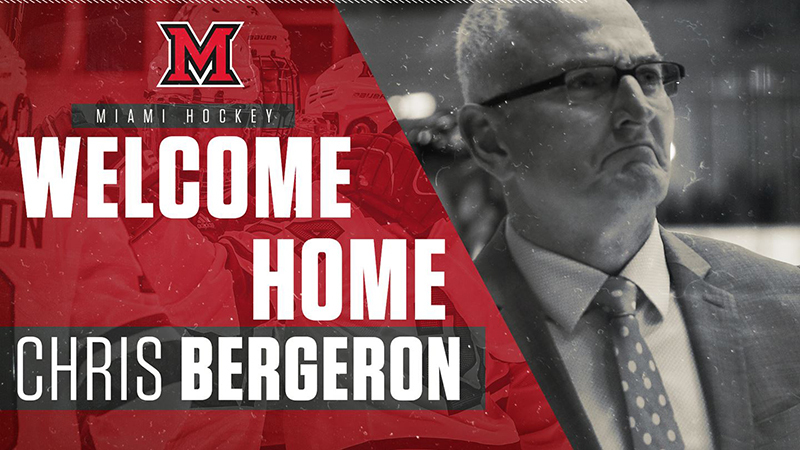 Bergeron, a 1993 Miami graduate who played on the school's first conference championship team and NCAA Tournament qualifier that same year, has been the head coach at former Central Collegiate Hockey Association rival Bowling Green for the past nine seasons. Under his guidance, the Falcons have gone 171-154-44 in his tenure. "I would like to thank President Crawford, David Sayler and Steve Cady for all of their support through this process and for the opportunity to be a part of Miami Hockey again," said Bergeron. "Janis, our boys and I are extremely excited to be returning to Oxford. Miami University holds a special place in all of our hearts. We are looking forward to starting this next journey in our lives." Bergeron took Bowling Green to two Western Collegiate Hockey Association Tournament finals in his last three years, taking the eventual champion to overtime in both occurrences. This past season, the Falcons broke a 29-year drought of missing the NCAA Tournament when they secured an at-large bid to the field of 16 thanks to a 25-11-5 season, a record that represented the program's most victories since 1994-95 and its first postseason berth since 1989-90. Bowling Green won a mere five games the year before he arrived on the bench and had not enjoyed a winning record since the 1996-97 campaign, but that changed in 2013-14 when the Falcons went 18-15-6 in Bergeron's fourth season. The Falcons then took a jump from there, posting 20 or more victories in five-straight seasons, going a collective 114-66-24 in that span. "We are excited to welcome Chris, along with his wife Janis, and his two sons, Logan and Connor, back to Miami University and the Oxford community," said Sayler. "As a successful student-athlete, captain and assistant coach here at Miami, it is evident that Coach Bergeron has played an integral role in the past success of this program. I look forward to working with him as we focus all our efforts on becoming more competitive within the NCHC and on the national level." Prior to taking the Bowling Green job, Bergeron played a crucial part in Miami's rise to prominence. His recruiting chops and influence on the bench helped the RedHawks go 226-139-37 (.608 winning percentage) in his 10 seasons as an assistant coach. MU went to the NCAA Tournament six times, advanced to the first two Frozen Fours in school history in 2009 and 2010, appearing in the 2009 National Title Game. During that stretch, MU won two conference titles (2005-06 and 2009-10), set a school record with 33 victories in 2007-08, earned a No. 1 seed in the NCAA Tournament twice (2008 and 2010) and was the top overall seed in the 2010 NCAA Tournament. Bergeron earned a bachelor's degree in education from Miami. He will be formally introduced at a press conference at 1:30 p.m. on Monday, April 8, in the club lounge at Goggin Ice Center. The conference will be streamed live on MiamiRedHawks.com.